Unfortunately, it's a little different from WoW spell (imagine gaining Spell Power as time went on but dead after 2 minutes, BFA version doesn't count) but it fits the theme I suppose. Minion Based Priest? I'm going to run 2 along with kelseth. the rest of the deck 1 mana minions. The mana burn tho... Not sure about this one. Way worse than keleseth...the tempo loss is huge and will kill you against any regular midrange / aggro deck. Shows how broken the prince is, imo. Cant see this ever being played. 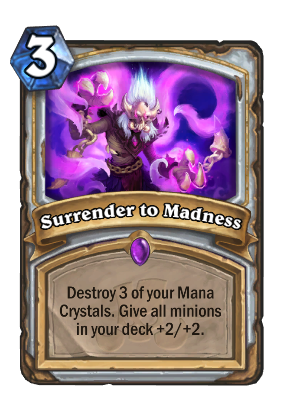 Priest already has one of the slowest start and sacrificing 3 crystals for a late game that may not appear... Who knows maybe Priest will get some good cards when other cards are revealed.. Haven't played Priest lately since it seems like even psychic scream at 7 mana is to slow. It's a card for a tempo deck that destroy your tempo. I'm not sure it will ever see play. For what profit is it to a man, if he gains the world and loses his own soul? Seems pretty bad at first glance, unplayable early and not that strong late. So maybe something to play in a priest zoo at turns 4-5-6 could work to beef up your mid game. Doesn't matter if it is good or not, people are surely going to experiment with Aggro Priest now. Interesting card, but priest needs serious card draw for it and minions that helps with it. Might work in wild, but still it's not enough. Mana cost is probably too high, but every aggro-deck probably use 2 Radiant Elementals anyway. Still: we are lacking too much information for this card; we haven't seen a single other priest card yet.